Sometimes I babble on about rubbish (Who said I do it 24/7? ), but if I find a fix or ‘another’ way round a problem, I like to share it with others. I did just that by mentioning Sugru® in a blog comment the other day. I thought no more about it until Kate got in touch with me yesterday. 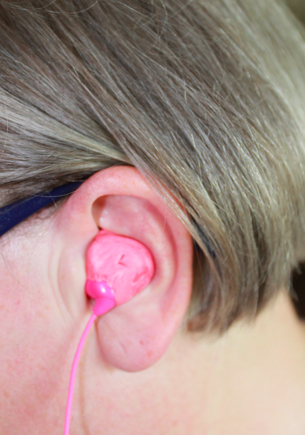 She wanted to show the way she used Sugru®. Wonderful! 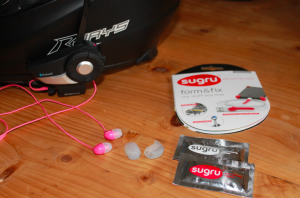 I have no connection with the Sugru® Empire – Well it has developed and grown since the days I first heard about them. I have used the product many times successfully over those years. Sugru®. 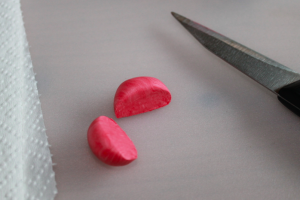 It’s a self-setting mouldable silicone rubber. I love this stuff. Particularly since I’ve just saved myself several hundred dollars by using a quarter of a package which cost me $12.00 or thereabouts… And no, they’re definitely not paying me to write this. 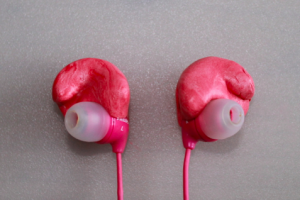 Earbuds and two small packs of Sugru®, one red and one white. That greyish stuff in the middle is the original silicone putty. Yuck…. The red and white blended together to form pink. Enough for two ear moulds and a bit left over. 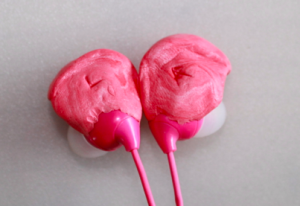 The finished ear moulds. Not pretty, but effective! Marked left and right. So important for those bleary-eyed early morning starts! A perfect fit. Thanks, Sugru®! A very short season, giving Cecilia a reason to share her wonderful philosophy on life, with a magical turn of phrase! No matter how deep life throws her, she rises to the surface and swims above the storms on a cloud of positivity. Yesterday the air felt dense. Not hot and not cold, just full and thick. The clouds stayed low, heavy, old, bosomy. Like flat pillows. There was no wind and little sound. Even the birds were quiet. The night crickets played their instrumental feet softly as though the night was nigh – all day their orchestra played. The day barely lifted from its grey night. The Professor, the little kitten, died yesterday morning with a small sigh of relief, the quiet stillness of the awakening barn wrapped about him like a drifting veil. He had been living here for one week . I know I have said this before but it is a cornerstone of my manifesto. Each soul that touches yours has value. No matter how long that touch lasts. It has worth. It is a lesson. So listen. Some relationships are very short – snippits, flashes. ‘Time will sort it for you as long as you allow it to’. A post worth giving time and thought to! As we slowly slide up and down the temperature scale, wandering through another wintery season of inclement weather reminiscent of the 70’s when I lived here last. I am struck by how much easier life is when you allow the inevitable flux of patterns and puzzles and allow Time herself a voice in your daily analog. Giving the passing of time a value in your calculations. I am sitting here glass in hand drinking a quiet toast to the memory of my beloved Jack. Today 10th February would have been his ninety fourth birthday. We always marked the days in our own quiet way, and I still continue to do so. My Granny, the one you hear so much about was born one hundred and thirty years ago, yesterday. I include her in my celebration. I have another reason to celebrate tonight. An ongoing project that my Toyboys were working on reached completion a few hours ago. It was not always easy, and I wondered at times if it would ever come to pass. 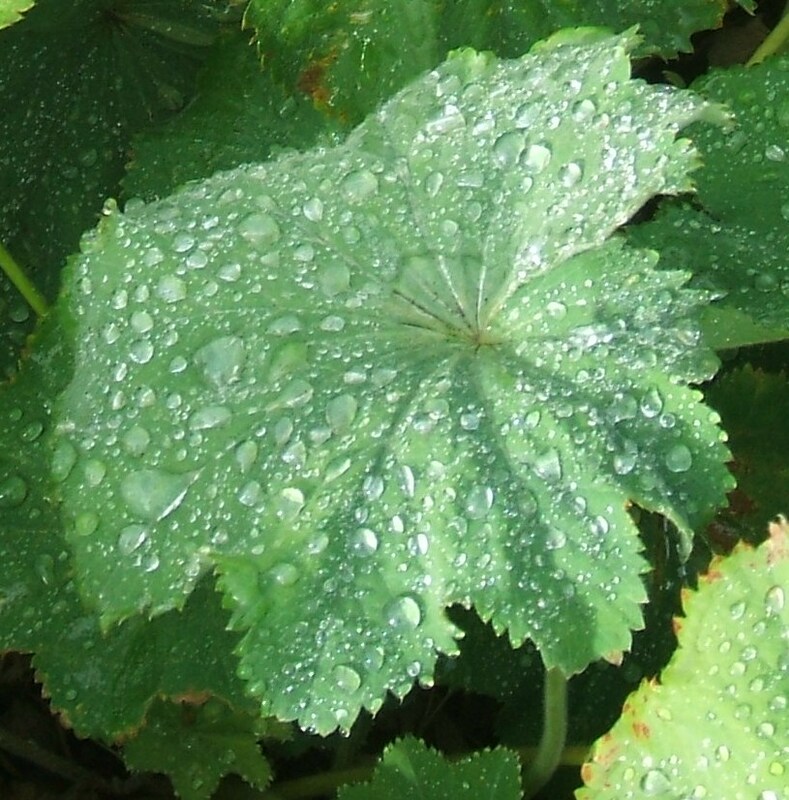 Back in the mists of time I entered the world of blogging. It was 2006 and I used the Blogger platform. It worked well at the beginning, but then formatting, placing photos etc., became a BP raiser. Time to change. I moved to privately hosted Grannymar.com in 2007. I considered myself still to be a newbie, understanding little of what went on in the bowels of the blog. Back then I knew nothing of Headers, Plugins, Widgets and I thought a Jetpac was something worn by folk involved in the sport of Jet skis! My old theme became dull and old fashioned, and I wanted a brighter and sleeker look. I was also having problems with posting so it was time for an update. The Toyboys looked at my back end and were horrified! It was ancient and obsolete. Stop that sniggering back there, we are talking about my blog! Much work needed doing, if the large number of posts were to be saved. I decided to vacate the premises and let them get on with the make over. Thus began Grannymar(dot)wordpress(dot)com. I grew to like the theme and the easy way the back end worked. Perhaps age had mellowed me into watching what was going on back there and being more adventurous. As I played, the Toyboys slogged on my behalf. Darren, Anto, James all played a part, but it was Phil who kept me up to speed with all that was going on. He taught me plenty along the way and sent me to sources that explained in my language what I wanted to achieve. Thank you Phil. So now we are ready to unveil the all bright and shiny Grannymar.com. From tomorrow February 11th visitors will be automatically taken to my new abode. You should not really notice much difference, or maybe I should play a game and ask how many differences you can find…. He sat silently for a moment or two and finally answered,…. I wonder why my oldest brother sent this to me? Do you think his aim was to encourage or discourage me from going into a home for the bewildered elderly?